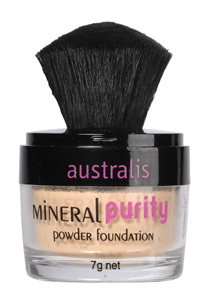 Create a super smooth luminous complexion with the new Australis Mineral Purity Powder Foundation. The pure mineral powder formula allows you to create buildable even coverage that lasts all day. The lightweight powder looks and feels like you are wearing no make-up. It contains no talc, parabens or fragrance, ensuring that your skin is free from any irritations. Available in five shades, the foundation includes a soft silky kabuki brush to help you achieve a natural flawless application.